I love easy Easter Decor. You can't get any easier than a free printable! Your print it the kids can cut it out and tape it (or staple depending on the page of your kids) to a string and BAM you're set to go. Let's face it! Easter can be busy enough! With having to get Easter Baskets and all. We decided a few years back to make our own Easter baskets. This came from when I couldn't find what I wanted for our younger kids. I didn't want baskets packed full of candy. So we made our own. We use mostly spring outdoor activities to encourage the kids to get outside as the weather warms up. Back to the Easter printable! You can get it below. 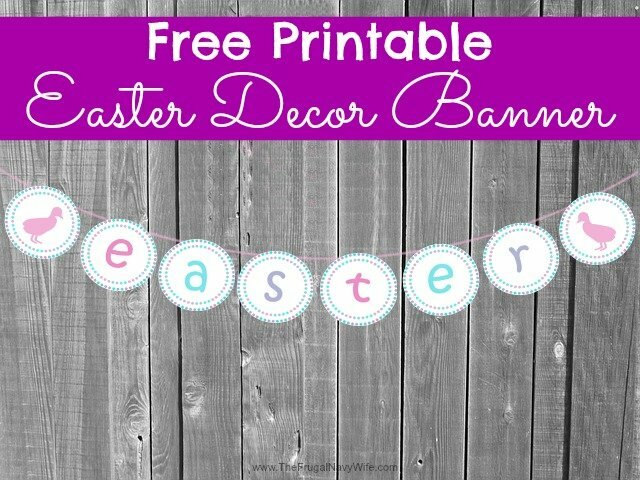 You can download your Free Printable Easter Decor Banner. Save them to your computer (they are PDF format) and I suggest printing them on Cardstock Paper. You can use white paper and print them in color to use colored paper and print them out in black ink. Then have your kids cut them out and tape or staple them to string to hang up. You can also take 3 colors of string and braid them together for a multi color look as well! Another suggestion is to allow the kids to cover the letters in glue and glitter. If your have older kids that can do this without making your house look like a fairy lives there! Trust me if you have younger kids you will have glitter in places I dont even want to talk about. Been there. Done that. Got the T-shirt. Can't pay me enough to go back! Looking for more Easter Decor? Check out my Easter Pinterest Board for Easter Decor, Recipes, Crafts, kids activities and more! Follow Danielle Leonard – The Frugal Navy Wife's board Easter on Pinterest.